See you at the "IWA" fair in Nuernberg, Germany where we present a wide range of our beautiful firearms. And so know, she is not a thing, she is a creature that dreams and sings, the times that were swirl around her, of a thousand hunts a light breeze. For aficionados of the finest the gunsmith craft has to offer. Throughout history chosen, prosperous hunters have gone to their gunsmith to discuss their wishes and requirements for a hunting weapon, often taking the hunting range where the weapon is to be used into consideration. The gunsmith takes all his skill and experience and goes into the hunter's wishes thoroughly. Ferlach in Carinthia, Austria. A small town dwarfed by the mighty Karawanken Mountains, on the periphery of world events, a European town steeped in history and tradition. The church marks the center of town, as indeed it does in most old European cities. In front of the church is a small park lined by old trees. Ferlach is rather small as cities go with narrow and winding streets leading through the labyrinth that makes up the urban center. In the shadow of the church tower, but standing proudly alone, with an almost rebellious air in architecture we find a centuries-old patrician house. It's almost as if the spirit of generations of Ferlacher gunsmiths is expressed through this house. Ever since the 16th century, the gunsmith guild has made this small Carinthian city into something special - 'the city of gunsmiths'. Over the centuries the gunsmiths of Ferlach have secured a special place in history for their city. And over the centuries the gunsmiths and the city have kept to their own ways. 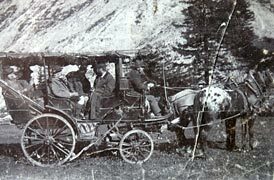 At first, the mighty Habsburg empire, then the rich landowners provided the gunsmith's city with wealth, freedom and security. Of the many gunsmiths - at one timer there were over 100 in the city - only a few are still active. A few have resisted the stormy times, retaining pride in their craft and upholding tradition by a adding a new dimension of quality to the making of hunting weapons. 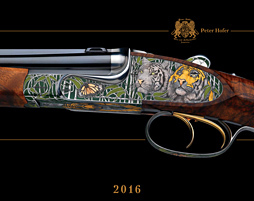 The youngest among them is also the most consistent and most successful: Peter Hofer's hunting weapons unite tradition and innovation, artistic handcraft and the will for perfection. Peter Hofer lives and works in the patrician house that states its importance even in direct proximity to the church tower. The square around the church gives off a dignified and quiet feeling, walking into Peter Hofer's workshop, visitors are surrounded by that imperturbable calm which always surrounds timelessness. Unexcited busyness fills the workshop. Polished steel, luxurious woods and shiny small mechanical parts 'decorate' the workshop. The aroma of fine weapon oil, wood glaze and polishing liquids are reminiscent of an artist's atelier. But there's more to it; anyone who has had the luck to visit the workshop of the world famous Swiss watchmakers Frank Müller or Blancpain and has seen the myriad of tiny technical pieces, especially regarding their perfect fit will find a parallel to Peter Hofer's work. The way the highly qualified and competent craftsmen in Peter Hofer's workshop handle the wood and steel shows the reverence and respect they have for the material. Every single part, however tiny or deeply hidden inside the weapon it may be, is meticulously and precisely worked out of the full material. Whether it is the perfected fitting of the metal parts, or the perfect work of Peter Hofer's in-house stock maker, it couldn't be done any better. The tools are applied carefully. Every part has its predestined place and inserts itself harmoniously, almost as if by destiny in the completed masterpiece. 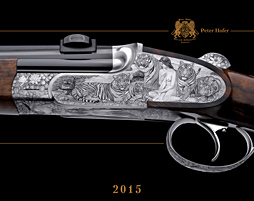 Every weapon that Peter Hofer hands over to its new proud owner is unique. Countless inspired steps have made a thing that is infinitely more than the sum of its single parts. And every weapon has a very personal meaning for its new owner. It is a part of his personality as a hunter that can never be replicated anywhere in the world, like a fingerprint or a family crest. Peter Hofer sees it as a personal challenge to fulfill his customers' most unusual wishes and to find technically feasible solutions to their requests. He culls from the deep well of gunsmithing tradition and adds to it his own special gift to invent and develop new ideas and technical solutions, to bring to life things which hitherto had been considered impossible. And so Peter has created many remarkable weapons.